How do you cope in moments of stress? Do you turn to food? To Netflix? Do you lash out in anger, or withdraw from others? You're not alone. Whether it's a career change, a relationship shift, a health scare, or overwork, most of us don't have healthy, strong coping mechanisms in place for these moments of uncertainty. And while these experiences can be scary, they're also invitations to look deeper at ourselves and how we show up in the world. Perhaps you feel overwhelmed, unsure, angry, or sad. Maybe there's guilt or shame for what you've done in the past, or fear of what will happen in the future. Even though you keep trying to find solutions, each attempt fails again and again. Let's focus that energy and transform it into a new way of being in your body, your mind, and your life. In your personalized wellness sessions, we'll bring together the knowledge of ancient and modern times. We'll use healing modalities ranging from the oldest philosophies of Buddhism and Yoga to modern psychology and neuroscience. We'll create unique, personalized plans to build your confidence, joy, and peace. Some of the techniques we may use are breath work, meditation, visualization, physical movement, Western nutrition, modern psychology, and the science of productivity. Each session is tailored to you and your goals. 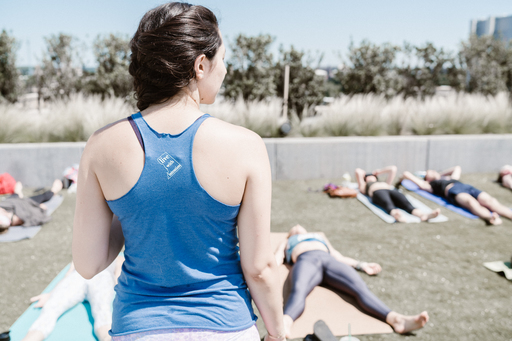 We may spend 50 minutes on our yoga mat, 50 minutes in conversation, or anything in between. It's all based on what you need to transform, evolve, and walk out of our sessions feeling like the best version of you. When you work with me, there is no difference between the time we spend together and the hours between our sessions. I'm always there to support you via email and text: we are always working towards your goals together. Release tension and invite better sleep through practicing yoga asana and pranayama (breathing techniques). Invite self-forgiveness for infertility issues through meditation, visualization, and conversation. Inform a client's next career decision through techniques to uncover his skills, values, and authentic self. Increase a client's energy during the workday and maintain weight loss by examining her food logs and diet choices. Each relationship is different based on what will most accelerate your growth and help you achieve your goals. Sessions happen weekly for 1 hour in person or via Skype. There is a 4 session minimum for all services. Work with me and experience true honesty, non-judgement, presence, support, and joy. Contact me for a free consultation, and we'll discuss what personalized solutions would work best for you!